Staying active is great for everyone as it keeps us healthy and has tons of benefits for the body. Along with health, it can also be a great way to spend time with the family and bond over something that is good for you! At B&C Aquatics, we encourage families to stay active inside and outside of the pool. That’s why we’ve put together some tips to help the whole family enjoy physical activity together! Going outside is perfect for the whole family, as there is a wide range of activities you can do and endless space to do them! There are also seasonal activities you can do with the whole family so you can keep up the exercise together throughout the whole year. This can include going on family bike rides, a skiing and snowboarding trip, going to your local park, and tons more. We know kids love to play, so why not get involved and have fun with them? Not only is it great bonding time with your children while doing something they enjoy, but it can also be a good form of exercise together! From jump rope, to four square, to a game of tag, play time for the kids is a great form of exercise and one that you can get involved in with them. Playing group sports together makes it easy for the whole family to get physical activity while having fun. Luckily, there are lots of great sports that are both easy to play and involve multiple people. This includes basketball, badminton, soccer, ice skating, biking, roller blading, and many more! It can be easy to let physical activity slip down your priority list and lose the time to get out and active. 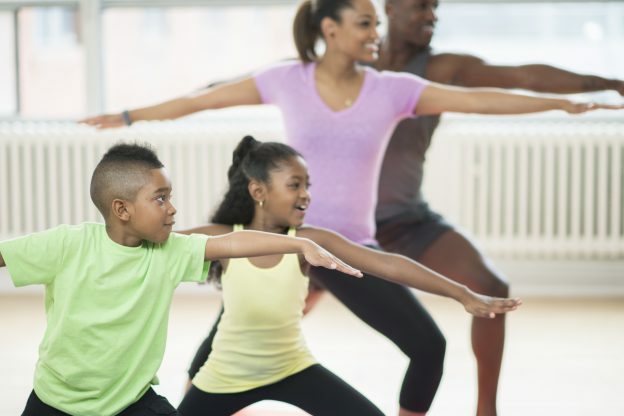 Planning a scheduled time that works for the whole family to exercise will help to ensure you don’t forget about it and instill the importance of making time for exercise into your kids.